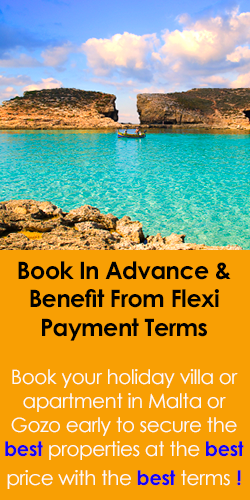 Airconditioned Five bedroom self-catering Malta villa located in the tranquil and prestigious area of Santa Maria Estate in Mellieha, yet only minutes away from the village centre, restaurants, sandy beaches and all amenities. Lovely 7 bedroom holiday villa apartment/s for rent in the exclusive villa area of Santa Maria Estate, made up of 3 independent apartments. Fantastic swimming pool area with BBQ enjoying sea views, garden, WIFI. Rent this Mellieha villa located in one of Malta's premier villa estates, St Maria, Mellieha. Four bedrooms, five bathrooms, pool and sunbathing deck, offering accommodation for up to 8 persons. Highly Recommended. Holiday villa with pool situated in Mellieha on the northern coast of Malta, among a small cluster of villas in Santa Maria Estate. This cosy, private villa is perfect for couples & intimate holidays, with northern beaches close by. Fantastic Villa with outdoor pool and indoor swimming pool and heated indoor pool, can be rented as a whole villa consisting of 3 apartment units that all interconnect with each other with one private swimming pool on Santa Maria Estate, Mellieha. Spacious villa to rent in Mellieha for short lets and holidays in Malta situated in a very exclusive and peaceful and exclusive valley known as Santa Maria Estatea. BOOKINGS ACCEPTED ONLY SATURDAY TO SATURDAY. A lovely villa in Santa Maria Estate in Mellieha with 4 spacious bedrooms and another area in the entrance used as sleeping quarters for 2 persons. All sleeping areas enjoy AC's. This is a large property with a private swimming pool and jacuzzi, sea and country views. Holiday Villa forming part of an 8 bedroom villa, may be rented with 5 bedrooms all on one floor & pool sharing facilities. 3 bathrooms, 2 kitchens, 2 balconies overlooking the pool area. Spend your holiday at this Self Catering Villa in Malta. Situated in a quiet and peaceful area of Kordin in Mellieha among the most prestigious villa estate areas in the north of Malta. Accommodation for 8-10 persons. A lovely holiday villa to rent perfectly located in the secluded residential area of Santa Maria Estate in Mellieha. Extraordinary Villa with indoor and outdoor swimming Pool . BOOKINGS SATURDAYS TO SATURDAYS ONLY IN PEAK SEASON. Found in the exclusive area of Mellieha - Santa Maria Estate. This holiday villa has a vast private terrace overlooking the pool & gardens, and a large shared pool. Free internet access available. Mellieha Bay is only few minutes away. Can accommodate up to 8 persons. Found in the exclusive area of Mellieha - Santa Maria Estate. This holiday villa has a terrace at pool level with surrounding gardens, and a large shared pool. Free internet access available. Mellieha Bay is only few minutes away. Can accommodate up to 6 persons. A lovely holiday villa that may accommodate up to 6 persons located in the quiet and exclusive hillside area of Santa Maria Estate in Mellieha. The property is fully air conditioned and enjoys a private swimming pool. Twin bungalow villa for Malta Holiday lets that accommodate up to 16 persons with an enormous pool deck & views of the sea down towards the coastal point of Santa Maria Estate in Mellieha. These are 2 interconnecting bungalows that can be rented separately or together. Rent a holiday villa in Santa Maria Estate, Mellieha, for your holidays in Malta. Enjoying a total of 5 bedrooms. 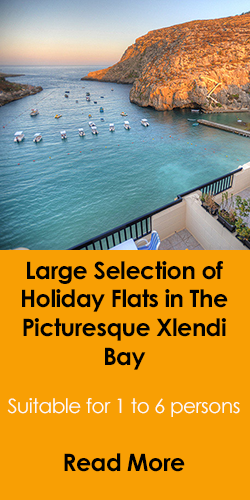 3 of which are located in the main villa, whilst the other 2 bedrooms are located within and an optional flatlet. Private swimming pool & large deck area. 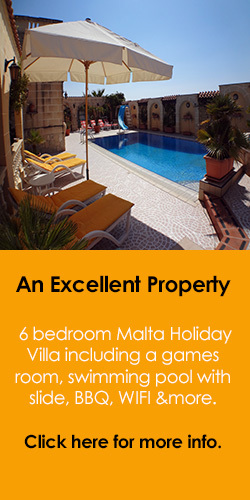 Mellieha villa for holiday lets offering spacious accommodation. Situated in the hilltop village of Santa Maria Estate, Mellieha, this villa sleeps up to 10 persons, fully equipped kitchen, BBQ, fully air-conditioned, pool. 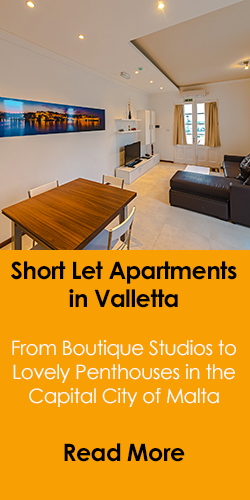 Mellieha Villa for rent offering spacious Malta holiday accommodation. Situated within the popular Santa Maria Estate suburb of Mellieha. Sleeps up to 6 persons, fully equipped kitchen, AC, BBQ, Pool. Villa for letting in Mellieha Malta providing accommodation for up to 12 persons. The villa may be rented out as a whole property (private) or as shared units with a shared pool. A spacious rental property, positioned right in front of the sea, offering rentals in Malta. A large pool and enormous pool deck with excellent sea view. Accommodation for up to seven persons. Private villa for short lets in Malta with a large swimming pool enjoying sea views from the pool deck area. 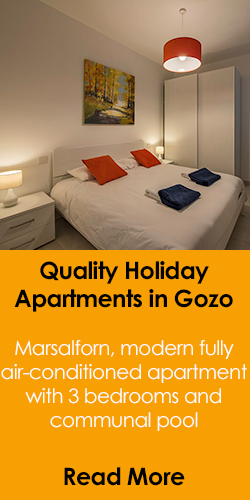 Mellieha holiday accommodation for up to eight persons in Santa Maria Estate.